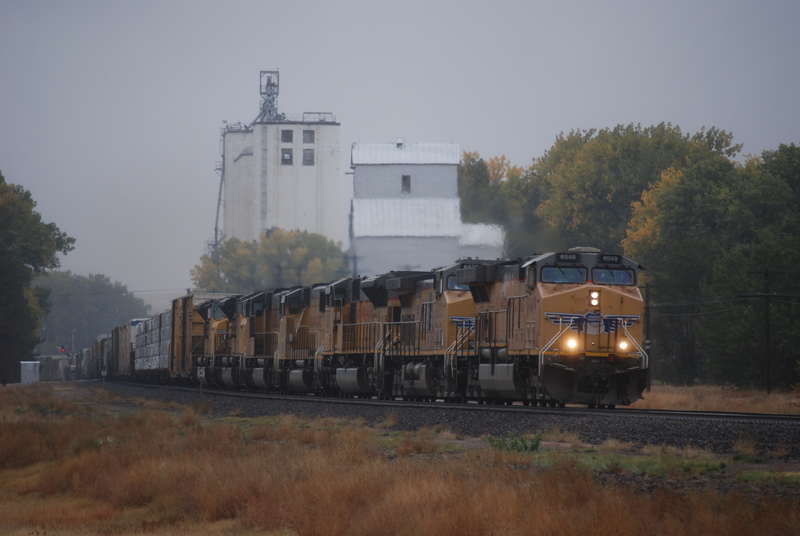 A Union Pacific train rolls by the elevators in Lodgepole, Neb. A beautiful elevator can be truly inspiring. My first visit to Lodgepole, Neb., was on a hazy October day, on the way to Wyoming, where we hunt elk. The misty skies did not show the elevator to its greatest advantage, so the best photography had to wait for a later visit. But this time I had the chance to visit the office and learn more about the elevator and the town. Melvin Paulsen inside the elevator driveway during corn transfer. 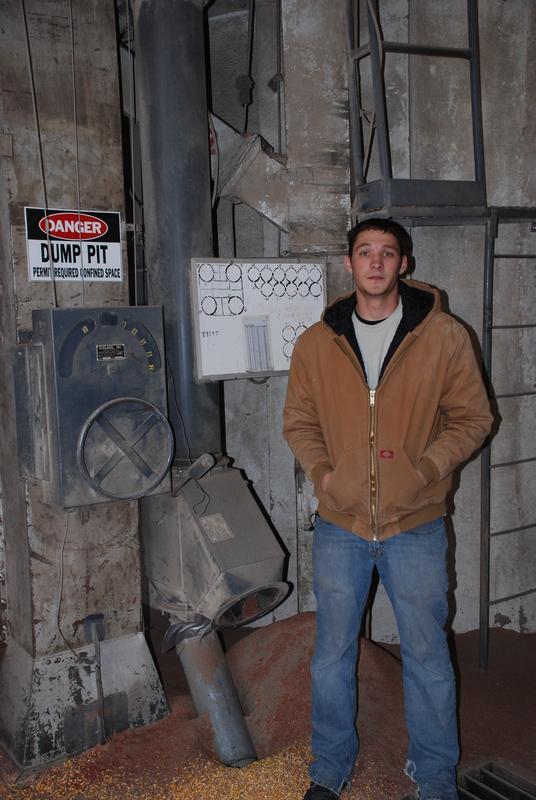 Melvin Paulsen, a two-year employee of the Frenchman Valley Coop, hailing from Julesburg, Colo., kindly showed me inside the main elevator. 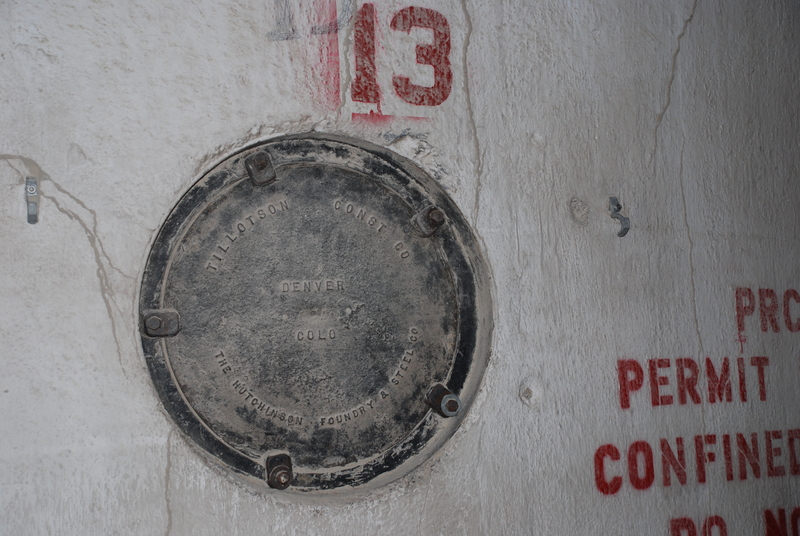 The interior lacked the embossed manhole covers that would reveal the builder, J. H. Tillotson, Contractor, but we knew the origins of this elevator from the recollections of my father Jerry Osborn. The Denver-based builder had lost its owner, Joe Tillotson, and superintendent, Bill Morris, in separate traffic accidents during construction at Lodgepole. The mishaps ended a successful run of elevator projects. 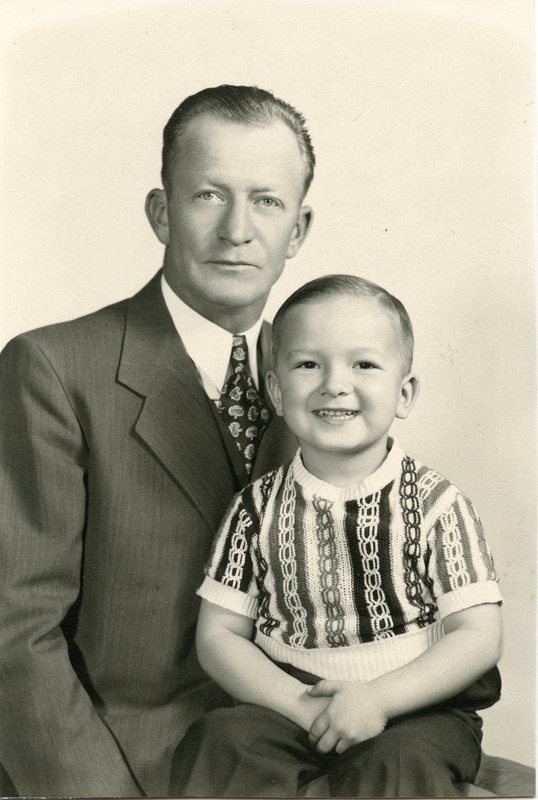 My grandfather, William Osborn, soon picked up the pieces and started his own company, Mayer-Osborn Construction Company, also based in Denver. 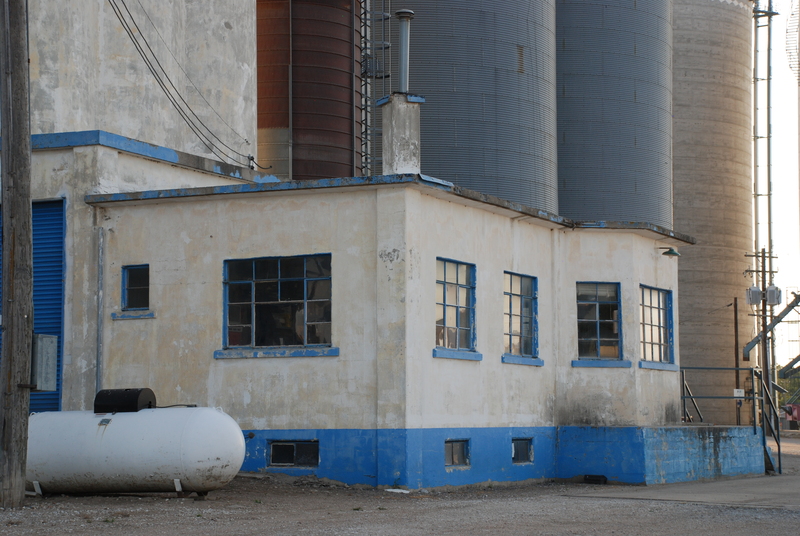 Melvin explained that the elevator was in the process of shifting grain from a main bin to the annex. 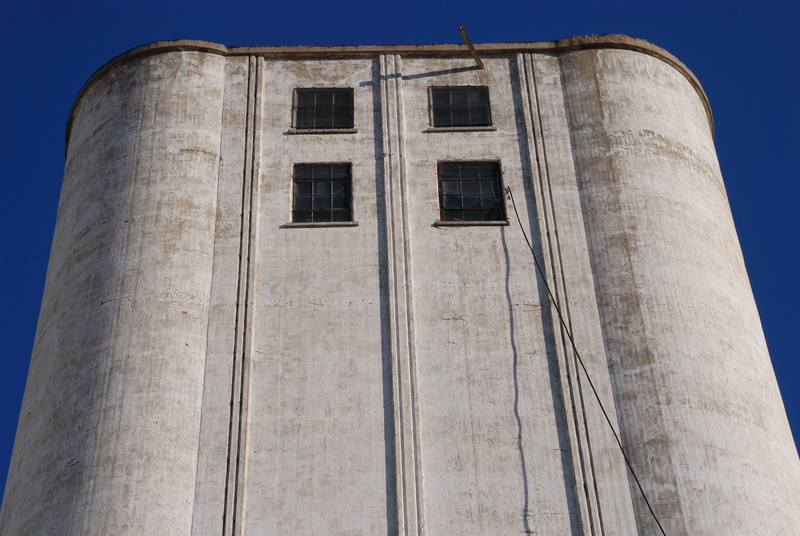 The grain dryer attached to the elevator was no longer operational, so only grain that was sufficiently dry (with 18 percent or less original moisture content) could be accepted for storage. Grain that was on the moist end of the acceptable range had to go to the annex, which had ventilation fans, to prevent damage from overheating. A fair pile of dust could accumulate during the grain transfer, so the elevator driveway was kept open to help blow it out. A shovel leaned nearby to take care of the remainder. Dust had to be cleared out completely to prevent an explosive hazard. One of the newer bins was home to an emergency response relay for radio communications between dispatch and fire and emergency responders. Inside the Frenchman Valley Coop office was an old aerial photo of the elevator and one that was taken during its construction. Melvin kindly furnished me with an extra copy of the aerial shot. The elevator looked very much like its J. H. Tillotson brethren. Lodgepole celebrates Old Settlers’ Days each year. The park alongside the railroad tracks fills with horses and buggies, tractors, vendors, and all manner of activities. A parade winds along the streets. The scene recalls a time when a farmer would drive his wagon up to the old wooden elevator on the rail line, and dump his grain in the pit, hoping for higher prices. The town also attracts visitors when the old Union Pacific steam engine, UP844, stops on a regular scheduled visit. 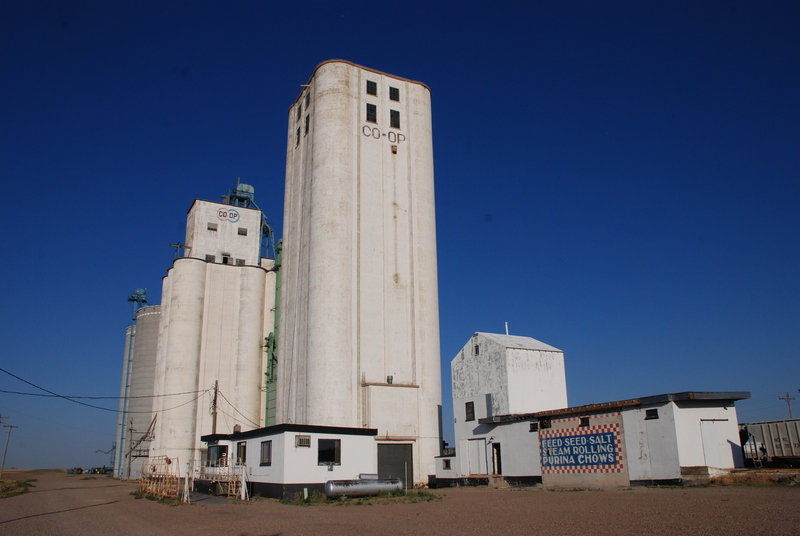 Lodgepole’s elevator was a milestone in my grandfather’s building career. It remains one of the most attractive elevators in Nebraska. Farmers line up their grain trucks at St. Francis, Kan.
One of the most pleasant surprises at the St. Francis Mercantile Equity Exchange was their historical record preserved in pictures. In its hundred-year history, the exchange has maintained a continuous presence on the site of the present elevator, and has seen many changes in technology. 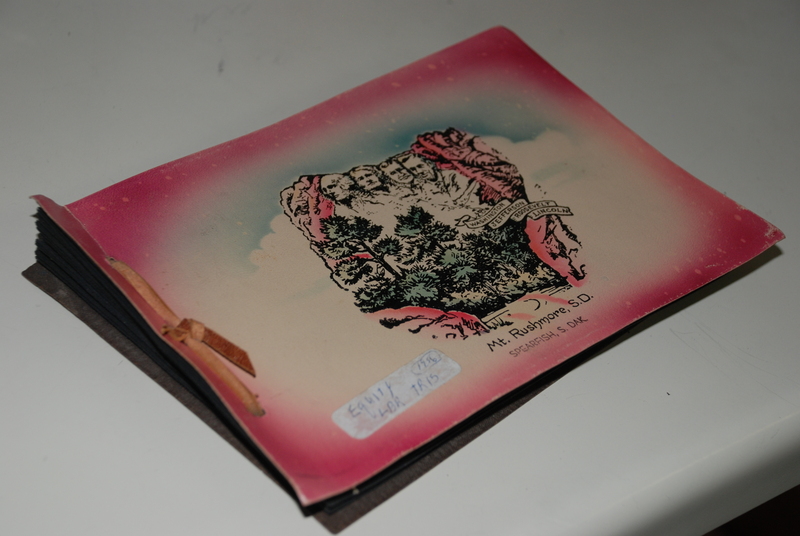 Fortunately, photos exist that document the old way of doing things, and Shirley Zweygardt, the site grain manager, was kind enough to provide copies. 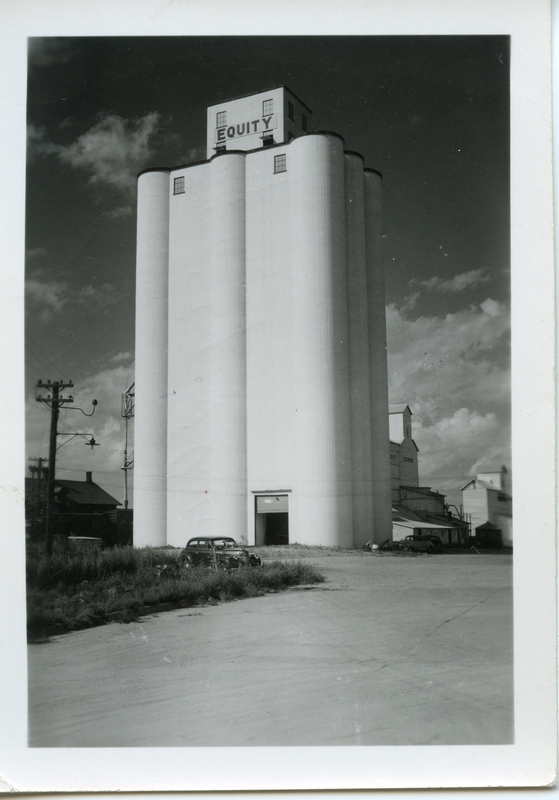 In this photo dated 1951, an old wooden elevator stands immediately behind the concrete house. It was demolished to make room for the second bank of concrete bins, built in 2000. It is always a fantastic find when you locate a pictorial history of an elevator. I had already acquired a 1947 dated postcard depicting the elevator, so we knew its age. These additional photos, dated on the reverse “1951,” show its stately beauty. They depict two additional wooden elevators, which have long since disappeared. The vintage automobile in the foreground of the first image substantiates the date of the caption. 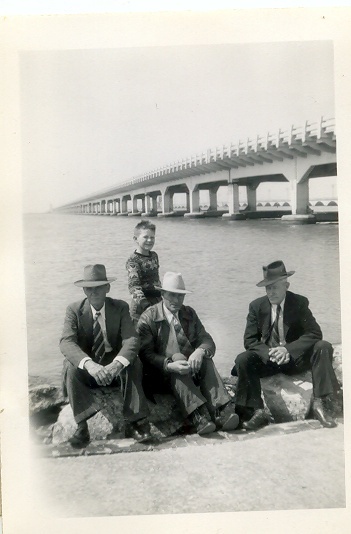 Without the car, this photo would appear timeless, even though it was taken shortly before the addition of the first annex built by Chalmers and Borton. 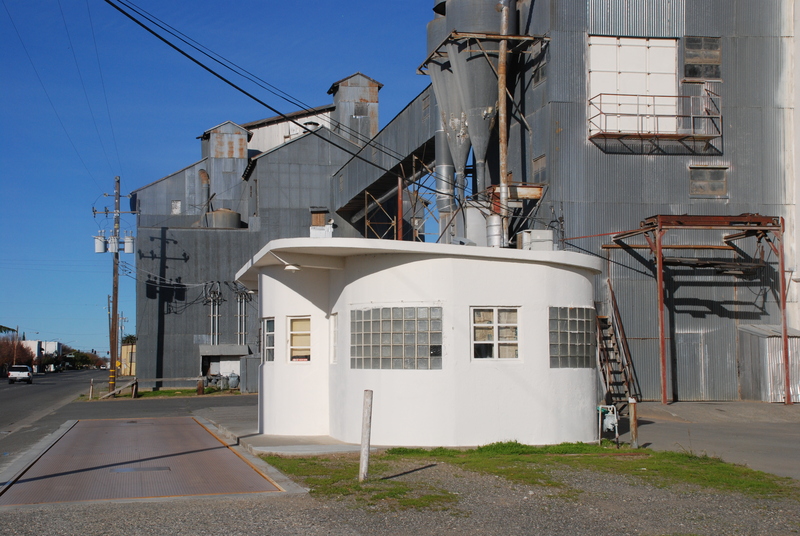 It was quite a lovely thing; by 1951, the largest known elevator built by J. H. Tillotson, Contractor, was celebrating its fifth year, and was still white and stark against the sky. 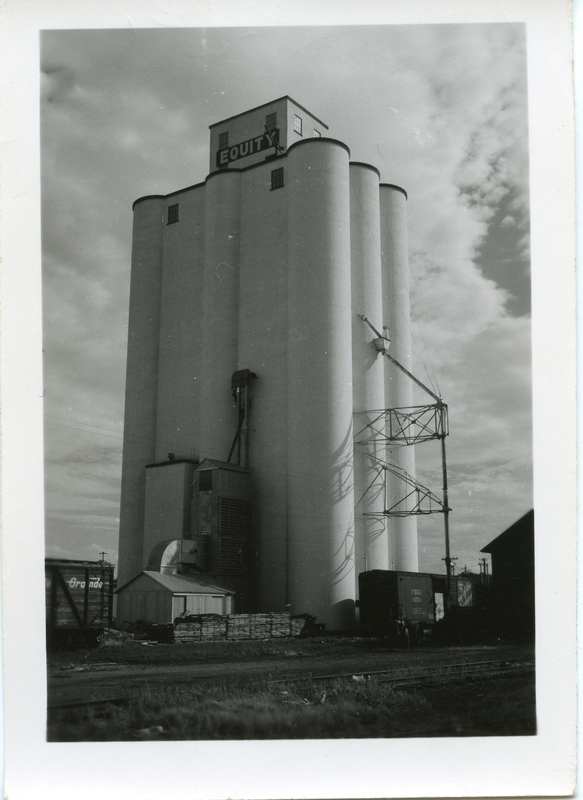 The elevator at McCook, Neb., was only two years old when this photo was taken, and my grandfather, builder William Osborn, had gone on to other projects with the Mayer-Osborn Construction Company. Shirley Zweygardt told me an elderly resident of the town had preserved these photos in an album, which she brought to the elevator office, where they became part of the records of the equity exchange. The prints, reproduced here, were duplicate copies, now part of my growing library of historical images. The visit to St. Francis was a happy one, capping an October 2012 elevator tour. This elevator marked the pinnacle of J. H. Tillotson’s construction career. Impressive still, it is a fitting monument to the skill, ambition, and industry of its builders. 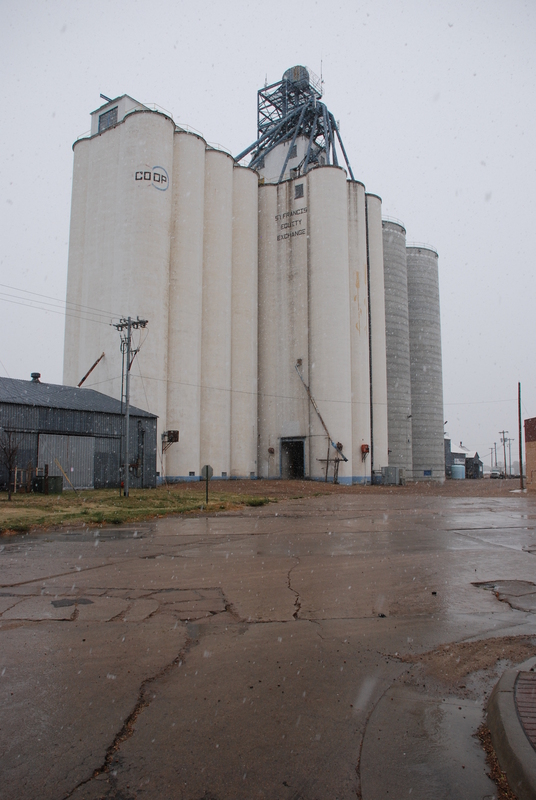 The J. H. Tillotson elevator in St. Francis, Kan. is nestled between two annexes. St. Francis, Kan., stayed on my mind for months after I failed to find any sign of the work of my grandfather, William Osborn, on our first visit. Out on the western end of Kansas, the town was well clear of any route our family would take on the way to somewhere else. It was a very intentional stop on our itinerary. On our first visit, we took a wide loop, arriving just after sundown, and we lost the opportunity to investigate further than one cursory look at the wrong elevator. The visit to St. Francis was shelved for several months, and I almost didn’t go, but when I did, I made sure to be there before nightfall. The weather caught up, however. 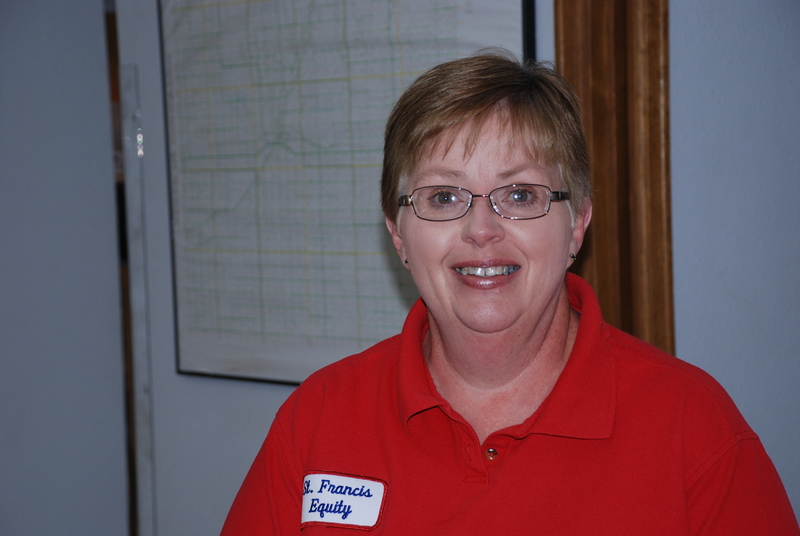 St. Francis Mercantile Equity Exchange grain merchandiser, Shirley Zweygardt. This time, I headed toward the highest structure in town. By the time I pulled up to the elevator office, fat flakes of snow wafted down and splotched the truck’s windshield, melting on contact with the ground. It was October, and the trees, which still held their leaves, were a golden brown backdrop for the early snow. I shook off the cold and entered the co-op. A surprise awaited. A long-time employee of St. Francis Mercantile Equity Exchange, Shirley Zweygardt, greeted me at the door. 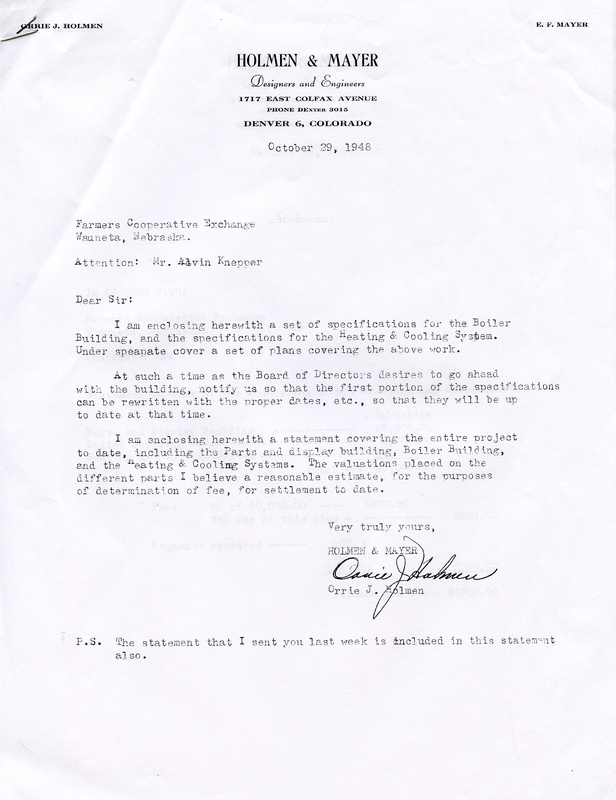 Raised on a farm just down the road, she was intimately familiar with the elevator’s history and purpose, so in 1979, when a job opportunity arose, she was glad to fill in where needed. It has been a happy arrangement. 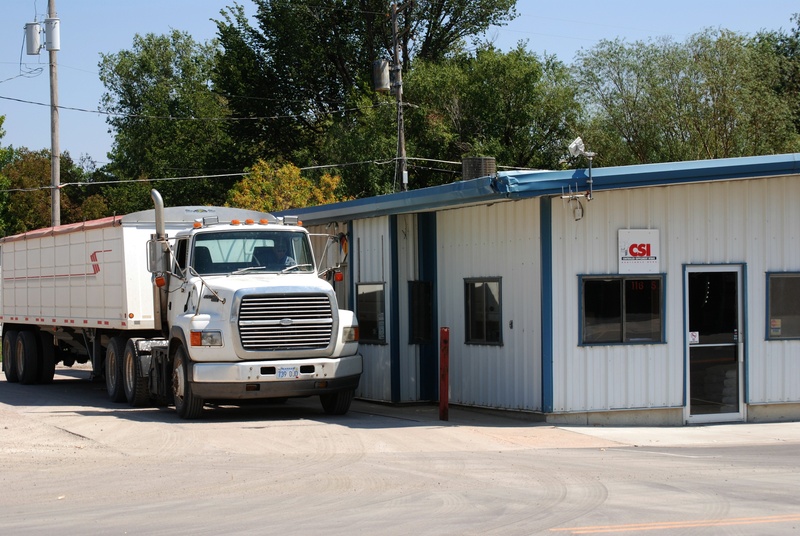 Shirley started as a bookkeeper, then worked in grain accounting and is presently in charge of grain merchandising. She has seen the St. Francis Mercantile Equity Exchange through many changes over the years. She asked me to sit down and have some coffee, and she shared her experiences of working around the old St. Francis elevator. The manhole covers on the interior of the driveway identify the builder. St. Francis Mercantile Equity Exchange was incorporated in 1913. As slip-formed concrete construction methods advanced, the equity exchange looked for a company to build their first concrete elevator. 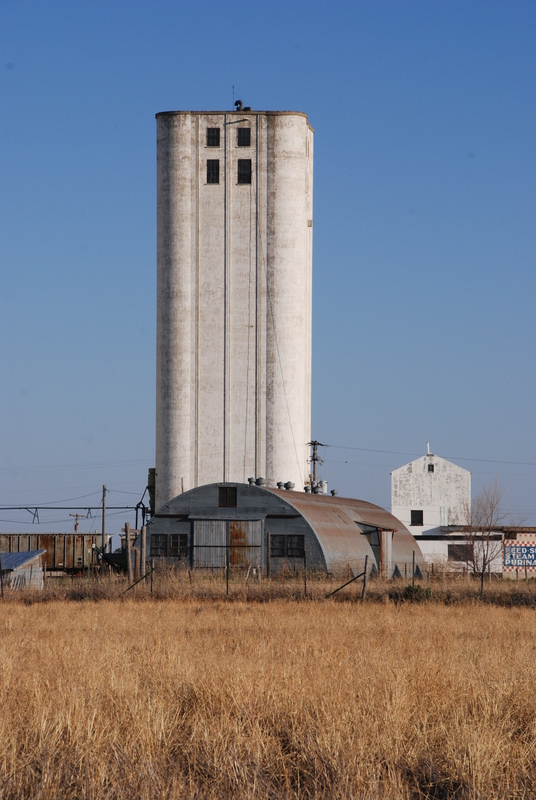 Once it was completed in 1946, their quarter-million-bushel elevator was the biggest and most modern in western Kansas. It more than doubled the storage capacity of its lesser neighbors. And lo and behold, it was built by J. H. Tillotson, Contractor, of Denver, with the construction supervised by my grandfather, William Osborn. 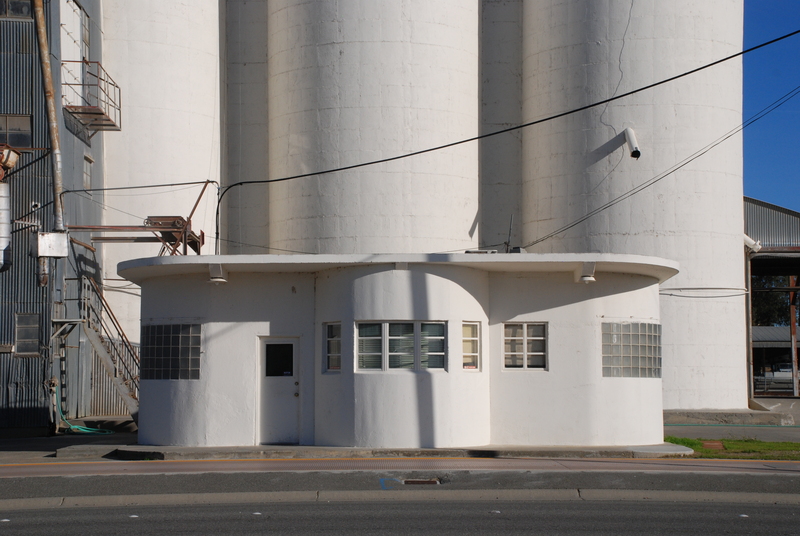 It was not the only grain storage on the site for long. 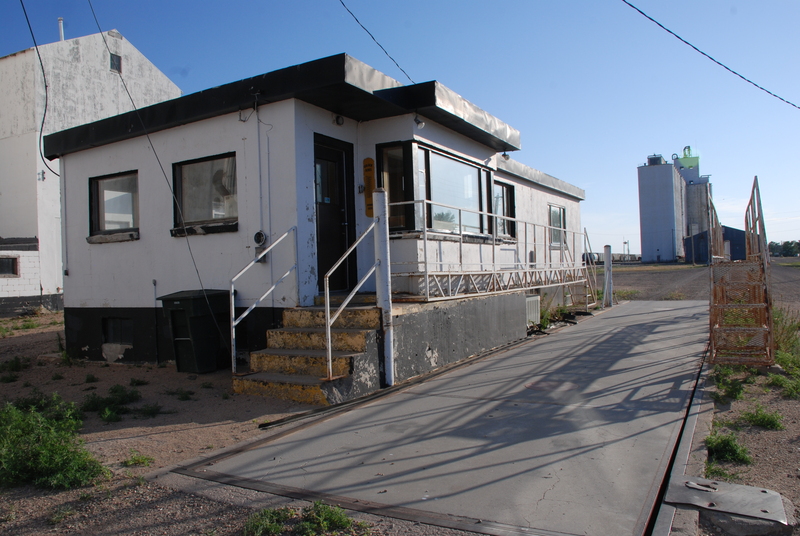 Soon, the capacity proved to be too little for the 1940s and 1950s boom years, so Chalmers and Borton came along and built the first annex. 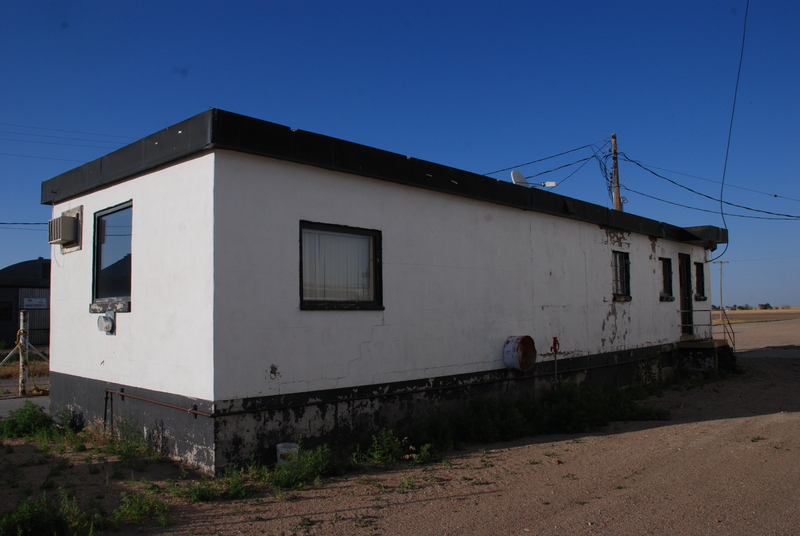 Later, the site incorporated a flat storage facility which only holds wheat, since its air system does not ventilate adequately for moist corn. A second three-bin annex was built in 2000, using the same old technique of lifting concrete up to a dump cart that ran on a track around the perimeter of the rising elevator. It was completed just before the onset of a seven-year drought, and it took a few good harvest years to recoup the investment, since the annual wheat yield was too low at first to fill the bins. Wall Street would not be the only beneficiary of perfect prognostication. 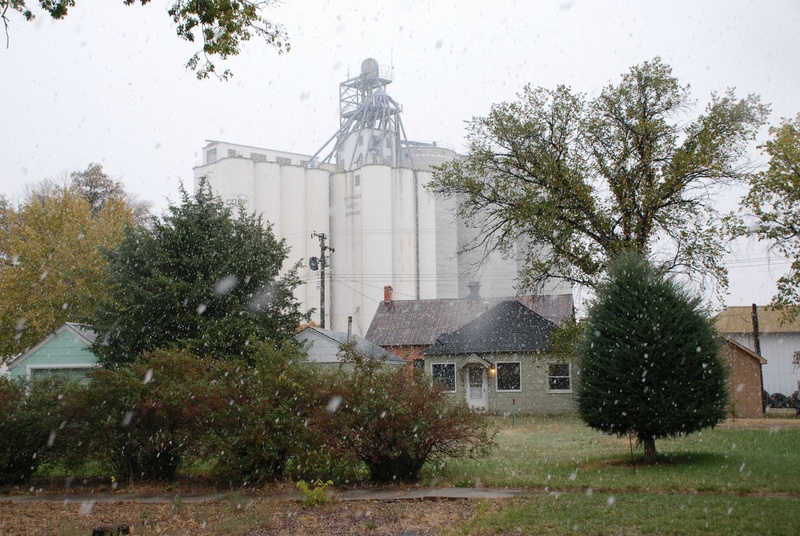 The present snowfall was gladly welcomed in St. Francis. The St. Francis Mercantile Equity Exchange will be celebrating its 100th anniversary this year. It has been and is the cornerstone of the town, and the center of business and economic life. 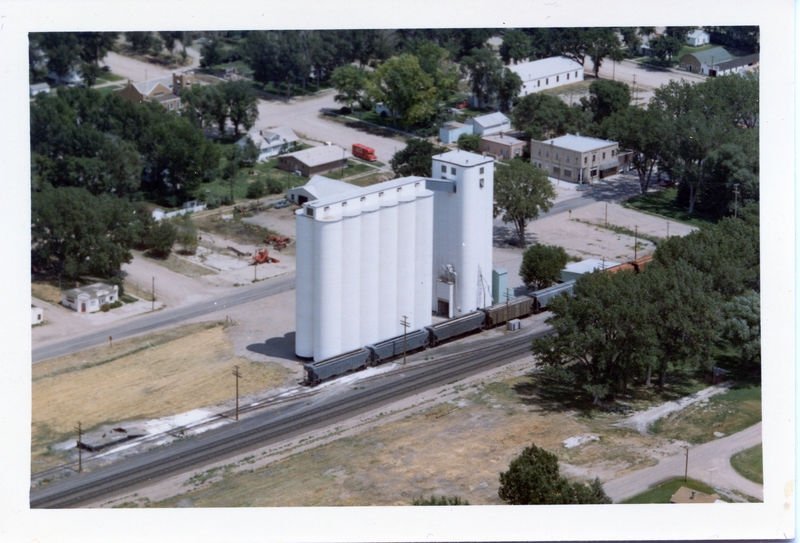 Stay tuned for a little more of the history, and wonderful images, of this fine elevator, which Shirley kindly shared. The Chalmers and Borton annex is in the foreground, and the new annex bins are behind the main house. The flat storage shed is on the left.